I decided to buy a lightweight harness for kiting and ridge soaring. I specifically wanted a reversible harness with a full airbag and without a reserve compartment. I also wanted to be able to sit in the harness, fly it from the training hill and be sure it would hold my full-sized glider before buying it. My online search found two comparable harnesses: the UP Alpine and the Gin Switch. I first contacted the UP distributor and asked to demo a UP Alpine. The distributor had no Alpines in stock and never offered to order one to demo. Instead, he tried to convince me to choose from the harnesses they had in stock, none of which had all the features I was looking for. Then I contacted the Gin distributor, Chris Grantham of Fly Above All. With no guarantee that I would buy it, or even like it, Chris ordered a brand new Gin Switch for me. I was able to demo it within the week. Now THAT’S what I call service! I really appreciate the fact that Chris listened to my request and took the initiative to order a demo harness with no guarantee that I would like it. He generously allowed me to keep it and fly it for as long as it took for me to decide whether I liked it or not. Thank you Chris, for taking the time to hear my request and helping me find the harness I was looking for. I love my new Gin Switch! Jeanie had a wonderful day yesterday on her first day of paragliding in Santa Barbara. She's a little sore today, but she calls yesterday her "best day ever". I look forward to spending more time in the coming months with you. 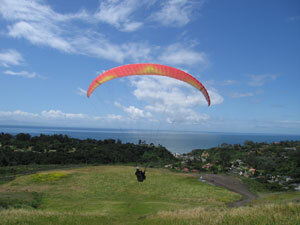 A few weeks ago my friend and I singed up - we got groupons- for a half day into to paragliding class in the SB hills. The Class was amazing, I was really surprised how much we got to do in such a short time. Our instructors were terrific, fun and very detailed! I will be coming back and signing up for the entire course soon!! Thanks for such a great time!! Here is a picture my friend took of me while the fog started rolling in mid way through the day. I just wanted to thank you for giving me the confidence and opportunity to have my first mountain flight today! It couldn't have been a better day and with good company of people to fly with. Really appreciate all the hard work and wisdom you instilled during my training process. I will work hard to better myself as a student , pilot and individual. Always a student. Thanks much to Bruce and Jimmy and Bob and the good bunch of FAA alumni and students I have met at the hill. I look forward to having more flights with you all. One last time I want to thank you all for the great paragliding clinics I had the opportunity to participate in these past few days. The material was well presented and I was truly impressed at the level and competence of every one of you. You all have a chemistry that melds together well as a team. And Santa Barbara was great. The flying was superb, as was the city -- a great place to visit and spend some time. I'll definitely be recommending to my friends back home that they plan a visit and a course or two. I just wanted to thank you all for making the lessons I took with you this weekend so informative and enjoyable. I'd like to especially thank Bruce, Bob, and James for all their patience and great instruction. You are all great instructors and I look forward to working with all of you in the future. And I'd also like to thank Lee Anne for getting everything setup and the lessons coordinated on such short notice. Your school is top notch and I look forward to coming back in the coming weeks to continue. I will be recommending your school to everyone I know interested in the sport of Paragliding! Thanks again! Just letting you know I had a fantastic time learning with Bruce. He's great and I learned a lot in a short amount of time. I'm hooked. I'm eager to continue my instruction and would like to talk with you about options. Thanks again for everything. I can't wait to fly again! What a Newbie Should Know about "Fly Above All"
One of the many enjoyable parts about paragliding is the help and support paragliders give each other. Whether you are standing somewhere wondering about the wind or fumbling for your "Ds," every paragliders I've run across is happy to help you without making you feel like a complete dolt. 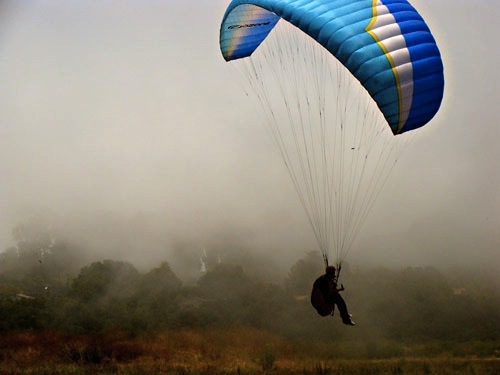 So, in a similar sprit if you are thinking about learning how to paraglide I thought I might help by relating my experience with "Fly Above All" in Santa Barbara. First, a little about me: I don't regard myself as particularly courageous; I'm no thrill-seeker, and Lord knows I am no extreme sports nut. More like portly, early fifties, wife and 3 kids, middle-class guy working at the local university who reads a lot. And "Fly Above All" is teaching me to fly. What I don't have in talent or natural ability I'm making-up in tenacity. One day I was out walking and saw a paraglider slowly floating along 10- feet above the bluffs at More Mesa, and it seemed frankly magical. I could see him flying just above me and it looked so easy and quiet as he floated along suspended in the air. A couple of weeks later for no particular reason I drove to Elings Park and from the bottom of the hill saw some paragliders landing in front of me on the meadow. The next week I made a point to go back, drive up the hill and just watch students and other pilots practice. The more I watched, the more I thought I might be able to do what others were doing, and if I could do that, well, I could fly. Actually fly. Unbelievable! So I went back, and back, then back again. For three or four weeks I just watched and listened, trying to stay out of the way but still get close enough to hear and see what was happening. It's a beautiful place to spend a few hours with my boy and dog, the view of the Pacific, the Channel Islands in the distance and by looking down you can see the break at Hendry's Beach, or look up and it's nearly 360-degrees of blue sky on a nice day. Besides the nice spot, I thought if I was going to put my life in someone else's hands then I better get the best teacher and school I could afford. Since I live a few miles from the Training Hill and enjoy just watching pilots kiting and launching, I could audition instructors. You might benefit from my experience. Teaching is a personal thing, it's done by people. It isn't so much the subject matter, though that's important too, or a particular method that can be repeated for uniform results. Different people teach more or less well because students learn more or less differently. I wanted to get the best teacher for me: knowledgeable, experienced, patient, and deeply concerned about safety, my safety specifically. Oh, I wanted someone nice too, who wasn't all ego or had a big attitude. You don't have to be nice to be a good teacher, but I find it's easier to learn from someone who I like. And it's a lot easier to spend time with someone who you enjoy. Bruce and Chad of "Fly Above All" have all of those qualities, and more. I am proud to be one of their students. Both Chad and Bruce know their stuff, down cold. The website goes through some of their background but doesn't do justice to their depth of knowledge. Their experience is so solid I bet my life and limb on it. They have seen and corrected every imaginable mistake you can make. I know because I think I made them (and I am working on others now). Bruce and Chad carefully explain how to recover from mistakes you can only imagine and the mistakes you hear about. Mostly, Bruce and Chad tell you what you should do, watch you do it, and then suggest the right way. When you put it all together, after a fashion, and get a flight in, they explain what they saw and the one or two things you should do better next time. Time after time, from pre-flight to landing, they are uncanny about mentioning just the one or two things you really need to know. Sometimes I know what I did wrong, other times after they mention it, a light goes off in my head: "Oh, yea, so that's what happened." But it didn't occur to me, and it probably never would have. At "Fly Above All" it's not just about mistakes or corrections either. Chad and Bruce are good about telling you what was right, what they liked, and what you did well. It's honest praise, authentic, not just to motivate but basically because that's what they saw and how they think. For example, one of "Fly Above All's" notable techniques just after launch when you are almost in the midst of mental overload, they calmly remind you to: "Sitback. Relax. Look up at your wing. Look around. Just let it fly." While "Fly Above All" has a set number of things you need to learn, and they have a pre-determined way of explaining it, Chad and Bruce are adept at adjusting their teaching to your learning. Just as they are "active pilots" sensing the right response to the air, they sense your strengths and weaknesses and adjust what they can so you can get the most out of the experience. The combination of core competency and natural flexibility makes them master teachers, as well as pilots. But mostly Bruce and Chad love what they do. And it shows. In Bruce's quiet words: "It's a great joy to teach others the gift of flight." Chad is so energetic and enthusiastic it is infectious. When Chad effortlessly demonstrates a technique, you know you are watching a master at play but making it seem easier, a little more possible, even if you know you'll never do it that well. For me, the price of lessons isn't cheap, so I kind-of consider it more of an investment rather than a cost. I want to get a fair risk-adjusted return for the long term. (I told you I'm no thrill seeker.) My money's with "Fly Above All" because they've been around a long time, in the same place, with rock solid experience, who seem to care about creating a strong relationship with their students and customers. Sure, there are a number of fine instructors and good pilots out there, but when you are beginner it can be hard to tell the difference. "Fly Above All" is a great place to find your way into the sky. My husband Eirik and I found "Fly Above All" on the Internet and talked to Chad Bastian soon after about lessons. Being from an area where there are no training hills, Los Angeles, the Elings Park training hill is the closest and nicest location we found. We took a total of six lessons at the hill and have spent numerous days, after we received our P2 certifications, flying and getting more experience. Throughout our training there was never a day that we were unable to fly due to conditions. The wind always blew from a favorable direction, but varied just enough to practice forward launches, crosswind launches, and even high wind launches. The launch and landing zones are large and free of obstructions making it easy for beginners to learn. We also learned, and continue to learn, a great amount from Chad's "support team" who freely give helpful hints and encouragement throughout the learning process. Our experience has been full of fun challenges and great learning opportunities.